I used VMware Orchestrator's REST API's to consume my coffee pot as an XaaS (Anything as a Service) element to let the Java flow. I developed an Orchestrator workflow called Create Coffee to make me a cup of Java for any operational tasks that may take an extended amount of time. Part of my motivation was wanting to challenge the notion of being able to really consume anything as a Service using VMware Orchestrator. workflow that puts an ESXi host into maintenance Mode, a task that can sometimes take a few minutes depending on workloads. 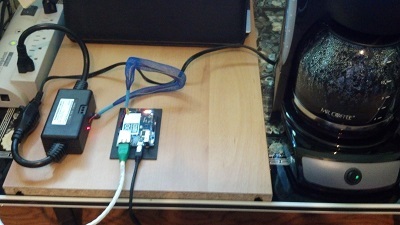 Using the Arduino Yun board simply allowed me to present a REST interface in front of my coffee maker. To achieve this, I used an Arduino Yun microcontroller, a PowerSwitch Tail II, a coffee maker and VMware Orchestrator. I connected the Arduino Yun's digital pin #13 for the positive "+in" and the GND port for the negative "-in" connection to the PowerSwitch Tail II. Using RESTClient, a FireFox add-in, I tested my REST commands against the Arduino digital pins. In Orchestrator, I added a REST host, REST operation, and then generated a workflow from the REST operation to communicate with my Arduino Yun microcontroller. Our host is in Maintenance Mode and our cup of coffee is ready!